When the storms of life beat against us it is easy to fall into the trap of thinking that God doesn't care about us. We think He has left us all alone when the truth is He is right there with us in the midst of the storm. Today we are reading Psalm 3, a psalm written by David during a storm in his life. Storms of life are hard - they're even worse when they involve family. David is on the run. Who is he running from? His son, Absalom. David found himself in the midst of a storm with his son at the helm of the uprising against him. Where can we go during the storms of our lives? Where did David go? David went to God in prayer! And we can, too! David refused to listen to his enemies who were trying to convince him that God had forgotten about him. He chose instead to remember the faithfulness of God to him in times past...times that God had been a shield for him, his glory, and the lifter of his head. Oh my friends, do not listen to the lies of your enemies...please remember that God is your shield in the storms of life. Run to Him as David did. Let God lift up your head during the storms of your life...let him be your glory! Whatever storm you may find yourself in today, I pray that you will cry out to God for help. Let Him sustain you, let Him give you peaceful sleep, and let Him fight the battle for you. Here is my S.O.A.P. for Psalm 3. I would love to hear your thoughts about this Psalm so please feel free to share in the comments below! Written by David when he “fled from Absalom his son”. 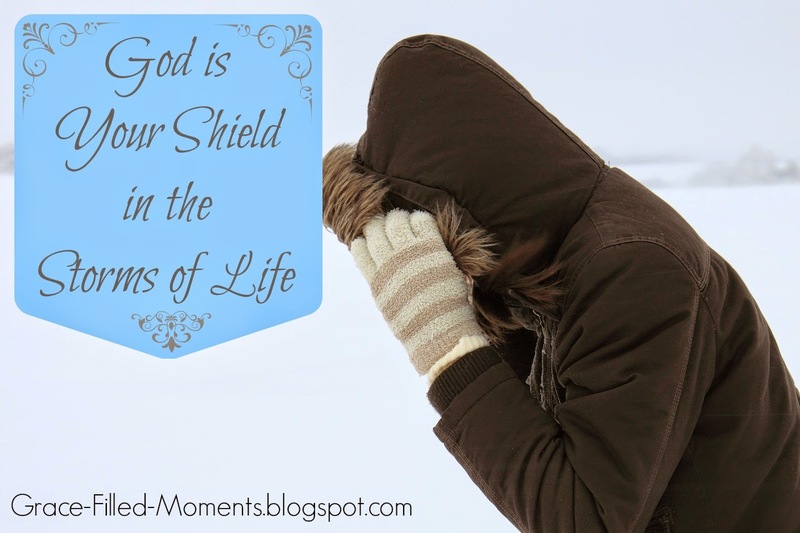 Observations: David knew God to be: a shield for him, his glory, and the One who lifts up his head. Knowing these things about God, David cries out to the Lord concerning his current trouble. God hears David’s cried for help. God sustained David because of his cries for help and so David is able to lie down and sleep even with tens of thousands of people surrounded against him, and awake again in the morning. David is held safe in the strong arms of God. David has experienced the help of God in the past, so he knows he can cry out to him for help once again and he can run again into the safe arms of his faithful God. He knows salvation is from Lord alone and that God’s blessing rests on His people. Application: When enemies rise up against us we can have confidence in God. We can remember how God has rescued us in times past and take comfort in knowing that He will be faithful to do it again. Prayer: Heavenly Father, thank You for Your faithfulness during the storms of our lives. Thank You for being our shield, for being our glory, and for lifting up our heads so that we can behold Your mighty hand fighting our battles for us. May we run to You and cry out to You in times of trouble. May we always be quick to remember Your faithfulness in times past and trust You will hear our cries for help today. In the faithful name of Jesus I pray. Amen! Here's our reading plan for this week. I would love for you to join me as we read the Psalms through December. In case you are just joining me on my Blogging Through the Bible journey, we already covered Psalm 1 and 2 back in September. If you'd like, you can read those two Psalms as well this week. **Chime In! What stood out to you in Psalm 3? Are you going through a storm? Have you taken your trouble to the Lord in prayer?